Love ribs but not quite sure how to make them? 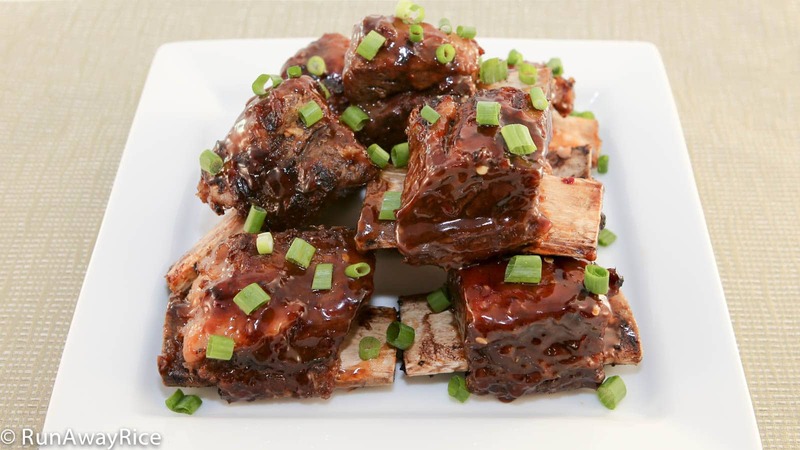 This easy recipe makes perfectly tender, juicy and flavorful ribs. We finish the ribs on the grill to get that nice charred taste and then top it off with a generous amount of a sweet and savory glaze. Is your mouth-watering yet? Usually when making these ribs I use the cross-cut beef ribs which are typically sold at the Korean grocery stores. Unfortunately, I couldn’t make the trip and ended-up buying the regular beef short ribs at my local grocery store. These are much meatier and they worked out really well in this recipe. I use 2 disposable foil trays to bake the ribs. They’re nice and deep and clean-up is super easy with these. The white vinegar is the secret ingredient to help soften the beef as it can often be tough. Don’t worry, the ribs won’t smell like vinegar. Be sure to use the wire cooling racks to elevate the meat so they’re not touching the vinegar. We don’t want our ribs tasting like vinegar. Covering the ribs with foil is the key to keeping them juicy and tender. The ribs are actually being steamed and will be nice and moist. Cut a 6-inch section of lemongrass. Peel and discard the tough outer layers. Cut the stalk into thin coins. Chop in food processor for 1 minute. Peel shallots and roughly chop. Add to food processor. Peel ginger and cut into small pieces. Add to food processor. Smash garlic cloves and then remove skin. Add to food processor. Add brown sugar, black bean soy sauce, sesame oil, Vodka 5-Spice Marinade, water and black pepper into the prep bowl. Process for 1 minute. Add 1/4 cup vinegar to each disposable foil tray. Place a wire rack inside each tray and then set the ribs on top, bone side down. Cover each tray securely with foil. Bake at 325 degrees Fahrenheit for 90 minutes. 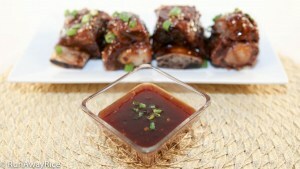 In a small bowl, combine Hoisin sauce, plum sauce and chili paste to make the glaze. Set the heat to Medium on the grill. Place the ribs on the grill, meat side down. Grill for 2 minutes. Flip the ribs over and then quickly coat each rib with a generous amount of the glaze. Grill for another 2 minutes, flip and glaze again. Remove from the grill and enjoy right away!